HOT FIREPol® DNA Polymerase is a chemically modified FIREPol® DNA Polymerase. 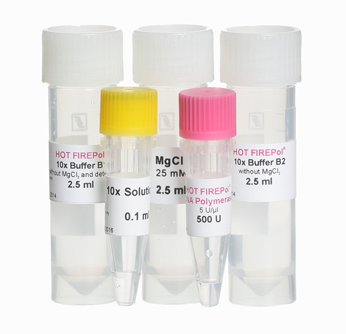 HOT FIREPol® DNA Polymerase is activated by a 15 min incubation step at 95°C. This prevents extentension of non-specifically annealed primers and primer-dimers formed at low temperatures during PCR setup. The enzyme has 5’→3’ polymerization-dependent exonuclease replacement activity but lacks 3’→ 5’ exonuclease activity. 01-02-00500 500 U 5 U/μl PDF PDF PDF 34.5 EUR Login to buy! 01-02-01000 1000 U 5 U/μl PDF PDF PDF 69 EUR Login to buy! Shipping and temporary storage for up to 1 month at room temperature has no detrimental effects on the quality of HOT FIREPol® DNA Polymerase.